I'm late publishing my next novel, JOSHUA'S FOLLY. After all, I originally announced in June 2012 that I had six completed novels that I would be slowly publishing over the next year. So, what's the hold up? LANCASTER HOUSE and THE MIDDLE AISLE are both dominated by the all-consuming question: Is Zoe crazy or not? This concept keeps readers eagerly turning the pages. SIERRA leaves readers on the edge of their seat, wondering if Alyssa will escape her kidnappers and find happiness in her new life. I HAVE PEOPLE keeps you guessing: Is Holly's life what it seems? Or are her memories skewed? The similar theme that runs through my books is SUSPENSE. Not 'murder-mystery' suspense, but the kind of suspense that keeps readers turning the pages, wondering what will happen next! I think I might have mentioned that Taylor Dean is one of the best discoveries I've made this year as far as authors go. I've read 3 of her books so far, Lancaster House, Sierra and now I Have People. There's one element that binds them together, suspense. That's a lot to live up to. Remember the song from Sesame Street: one of these things is not like the other . . . one of these things doesn't belong . . . can you guess which thing is not like the other, before I finish my song . . .
Realization hit. JOSHUA'S FOLLY is not like the others. I love JOSHUA'S FOLLY. I love the story, I love the romance, I love the setting, and I love the angst. However, JOSHUA'S FOLLY is not filled with suspense. I kept asking myself: will this novel disappoint my readers? This question has kept me from publishing the book. In other words: AUTHOR INSECURITY! I asked several beta readers to read it for me and give me their opinion of the novel. The consensus: No, it's not like your other novels. It doesn't have the 'suspense' that you've become known for. BUT, it is still a really good contemporary romance novel. Will I disappoint my readers with this novel? I seriously considered NOT publishing JOSHUA'S FOLLY. I shared my thoughts with my beta readers. They disagreed. They felt I should publish JOSHUA'S FOLLY. They felt it would still appeal to a large audience of readers. I went back and forth, unsure of what I should do. In the end, I decided to PUBLISH JOSHUA'S FOLLY! Yes, it is different from my other novels. But, if you enjoy a realistic contemporary romance novel, without ghosts, kidnapping, memory loss, vampires, or domestic abuse, then you'll enjoy JOSHUA'S FOLLY! Don't get me wrong . . . JOSHUA'S FOLLY is not lacking in the drama department! AND if you don't enjoy a realistic contemporary romance novel, no worries! My next novel, FOR NICK is signature Taylor Dean. It has plenty of 'suspense' to keep you turning the pages! So, off to the ebook formatter it is for JOSHUA'S FOLLY. Which means, I'll have it available in just a few short weeks! Thanks, Sherry! I appreciate your thoughts very much. I think I've spent too much time worrying about it. Time to be brave and release the novel!! But I do appreciate you mentioning that sometimes a love story is just a love story--and that's what Joshua's Folly is! My mom still says it's her favorite of all of my novels, but that's my mom and she loves my books because I wrote them, so I guess it doesn't count! But, hopefully others will feel the same!! I'm glad you're going to go ahead with it! Sometimes it's good to shake it up a little and have a completely different book that will appeal to different people (as well as those of us that love reading your books no matter what they're about)! I'm looking forward to your announcement that it's available to purchase. Such kind words! Thanks so much for your encouragement, Melanie. 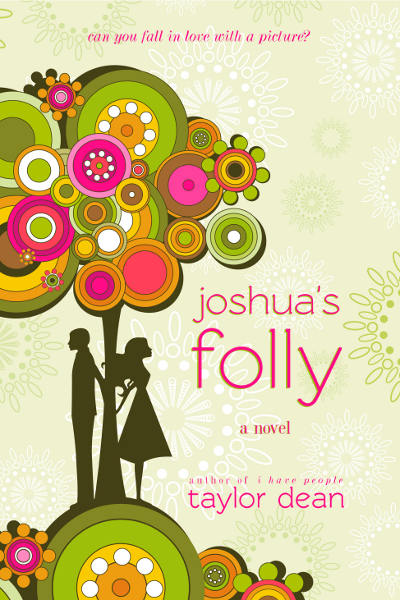 I hope people will love Joshua's Folly as much as my other books! I appreciate the feedback. So nice to hear you agree with my decision to release the novel. Makes me very, very happy! I'm so glad you decided to publish Joshua's Folly. It obviously spoke to you and your writing and characters are so vividly written, the suspense is there, if only because I can't wait to turn the page. It's different suspense, anticipation, but the best! I think anticipation is a much better word when describing the 'suspense' in my books. I like that. Thanks for pointing that out, Laura. It's a different book from my others, but I love it all the same and I just couldn't NOT publish it. Thanks for your support! Much appreciated.